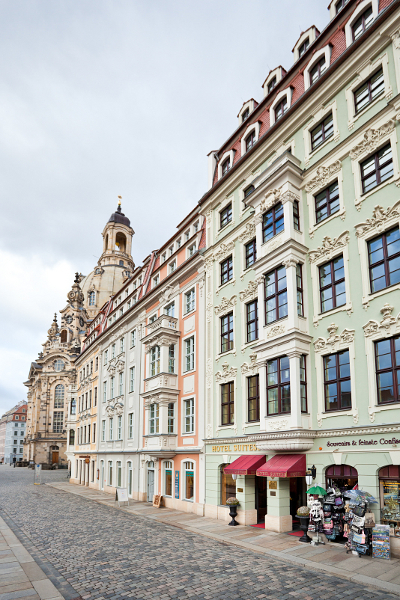 You will find the Hotel Suitess right in the centre of Dresden a the historical Neumarkt. You can reach us with your own car, by train and by plane. You get to us either from Dresden airport or from Prague airport. On request we organize your transfer from Dresden airport with our own limousine or by taxi. Just give us a short notice. From the airport, you get to the city centre and the main train station by the S-Bahn suburban train, line S2, departing from the basement of the airport. You get to Dresden with various EC and ICE trains. The Dresden main train station is only a five minutes drive away from the Hotel Suitess. We gladly meet you at the train station or arrange a taxi to pick you up. Just give us a short notice. Or you take tram Nos. 3 or 7 to get to the Hotel Suitess. Drive on autobahn A 4 or A 17 and follow No 170 highway towards city centre. The hotel entry is situated at Rampische Strasse 1. We have a garage in the basement of the hotel. Just drive your car to Rampische Strasse and leave it in front of the hotel. We will gladly park your car for you.